From Maine lobster to Maryland crabs to South Carolina crawfish, seafood - in all its delicious varieties, is a favorite. Having grown up in Annapolis, Maryland, Sara knows and loves her seafood delicacies. When steamed blue crabs are spread before her, Sara's often the last one left 'pickin'. And aw shucks...she also loves oysters on the half-shell. That's why a lot of Sara's art is crab-tivating! 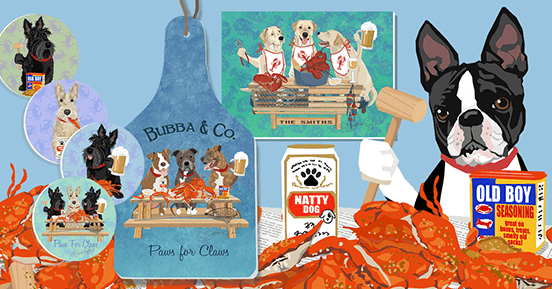 Many of her dog art themes involve the beach and seafood, including her two versions of Paws For Claws, where her whimsy and sense of humor has dogs at a Crab Feast and enjoying a Clam Bake. Finally, a Pearl of Wisdom...if you're in a pinch for a unique gift, don't be crabby...don't be shellfish...check out Sara's fun & happy art!